Ever wished your Jell-O was filled with Tuna? Neither have we! 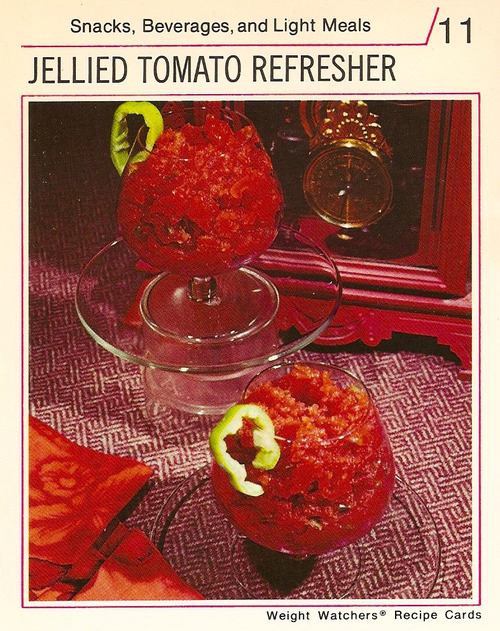 Yet we’re looking 5 of the most truly disgusting 1950s food made with Jello. Alright 1950s, you came out with some truly marvelous things in your time: poodle skirts and rockabilly fashion, pin-up girls and burgeoning rock ‘n roll music, and of course who could ignore the civil rights movement? Some things you did not excel at? Cooking. That’s right, the 1950’s was a time for home-cooked meals shared with family, but after looking at these recipes it’s no wonder we evolved into a generation of take out and fast food dining! One of the more disturbing 1950s food is this chicken Jell-O concoction. Why? Well the rule of life states that any DINNER that is made in gelatin form is going to be disgusting. Period. This mess calls for 3 chicken breasts (cooked), 1 teaspoon of minced onion, 1/2 cup of olives, 1/2 cup of celery, 1 cup of mayonnaise, some gelatin, and cold water to bind it all together. Stick that baby in a Jello mold and wham, dinner is served! Are you shuddering? Because we definitely are. Jell-O shots are a pretty common college drink these days, right? Still, mixing booze and Jello will not always result in playful personalities. In fact, we almost guarantee that this disgusting mix of gelatin, tomato juice, green pepper flakes, lemon juice, beef seasoning mix, Worcestershire, and cloves will only leave you doing one thing: vomiting. 1950’s foods made for curious meals, and we can’t imagine someone wolfing them down with glee. That being said, we can’t imagine anyone eating SPAM but apparently that’s still a thing. We digress. This fruity, cheesy dish is made by using 1 packet of lime Jello, 1 cup of hot water, 3/4 cup of cold water, 2 tablespoons of vinegar, grated onion (of course! ), and a cup-o-cottage cheese. Mix, mold, and chill that bad boy up. But wait, you’re not finished yet! 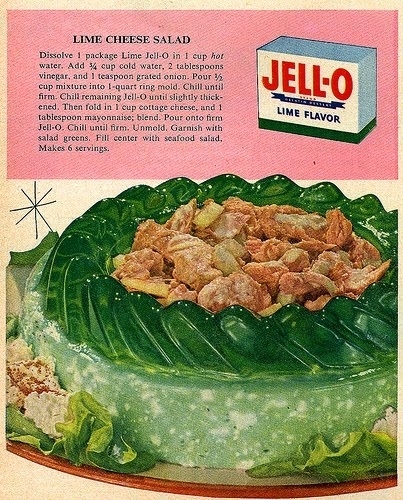 Because what goes better with lime Jell-O and cheese than a seafood salad? Mix up your favorite shrimp salad and use it to top this bad-boy off! Head to the neighborhood block party and slip your Jell-O-based-meal over on the counter. Thanks, hun! 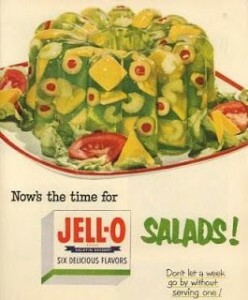 While we may shudder at the idea, the truth is Jello salads were the staple of “trendy” 1950’s party foods. Some favorite base flavors to use included lime and pineapple. And what do you put inside of it? Whatever your heart desires, apparently! 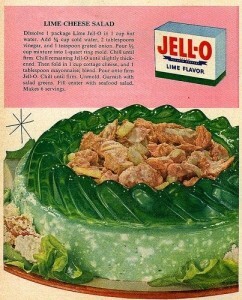 This disgusting photo features olives, possibly shrimp, fruit slices, and cheese, all encased in some lime Jell-O. Mmm, refreshing! Possibly the most disgusting, gelatinous 1950s foods we came across was this gem: The “Veg-All Pie Plate Salad.” Molded in a pie plate, this entry features a can of soggy mixed vegetables encased in lemon gelatin. That’s right, that’s it folks! The 1950s recipe card suggests serving with a tartar sauce garnish. We shudder. There you have it, some truly disgusting 1950s food… all made into a gelatinous concoction! Planning a 1950’s party platter for your next get-together? 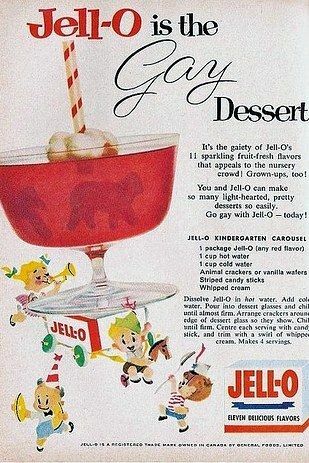 We definitely suggest skipping out on these 1950s Jello favorites and opting for a pizza, instead! Unless you hate your friends and wish for them to choke on tuna crusted Jello. We’re going to go throw up now. Rockabilly clothing VS pin up, Boho, & psychobilly – The differences!